All of the poker games that we're concerned with play with a standard 52-card deck. The deck is divided into four suits: spades, clubs, diamonds, and hearts. Each suit has 13 ranks. The ranks of the cards, in descending order, are ace, king, queen, jack, and the numerals 10-2. In most poker games, the ace can count as high or low; when low, the ace counts as the numeral 1, making possible the five-high straight of A-2-3-4-5. Always keep in mind that a poker hand consists of five cards. Even though many games use more than five-usually seven, as in Texas Hold 'Em and Seven Card Stud-it's the best combination of five cards that counts as your poker hand. Hand rankings in poker are determined by the relative difficulty of achieving them. That is to say, they are based on mathematical probabilities, or odds. It is much harder to get a flush than a pair in poker, and so the flush is a more valuable hand and is ranked higher. That said, there's a rather capricious aspect to how poker hands are determined. The most obvious example is that your odds of getting dealt four aces are the same as getting dealt four deuces. But the aces will beat the deuces every time. The value of the individual card ranking in poker is, statistically speaking, arbitrary, only the classes of hand rankings (full house, straight, flush, and so on) are based on the probability of getting that combination in five cards. Royal flush: Ten, jack, queen, king, ace of the same suit. A royal flush is simply an ace-high straight flush the best straight flush you can get. It's royal, of course, in that it contains all the courtly face cards. Straight flush: a straight with all five cards in the same suit, for example, 7h, 8h, 9h, 10h, Jh. When the ace is used low, you can get a five-high straight flush: Ac, 2c, 3c, 4c, and 5c. 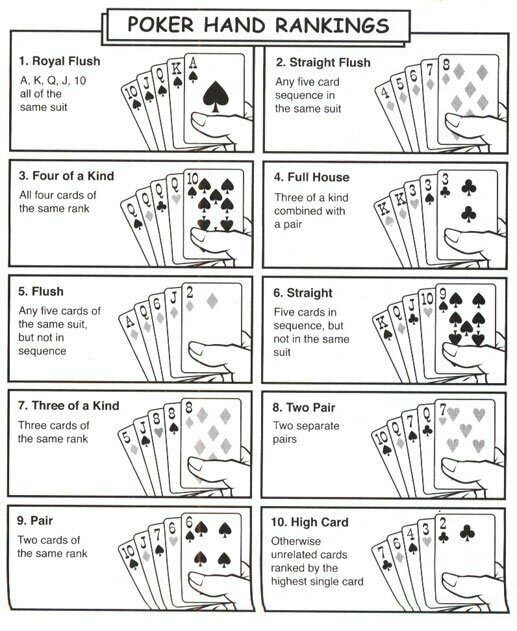 Four-of-a-kind: A five-card hand in which four of the cards have the same rank (plus one unrelated card), for example, 7d, 7h, 7c, 7s, 3c. Four-of-a-kind is also called quads. A higher ranked set of quads beats a lower ranked set; a set of four queens beats a set of four jacks. Full house: three cards of one rank and two cards of another rank. If more than one player has a full house, the full house with the highest ranking three-card set wins. A full house is sometimes called a full boat, or simply, the boat. Flush Five cards of the same suit, not in sequence. If there is more than one flush, the hand with the highest card(s) wins. So, for example, As, Js, 9s, 5s, 2s beats Ac, Jc, 8c, 7c, 5c. Straight: Five cards in sequence, of any suit. The ace can be used in the high straight (10, J, Q, K, A) and the low straight (A, 2, 3, 4, 5). When there is more than one straight, the highest card in the sequence wins. So a jack-high straight beats a ten-high straight. Three-of-a-kind: Three cards of the same rank, with two unrelated cards, in a five-card hand. Three-of-a-kind is sometimes called trips or a set. Two pair: Two cards of one rank and two cards of another rank, plus the extra card. If two players have two pair, the hand with the highest pair wins. If they have the same high pair, then the highest second pair wins. If they have the same two pair, then the highest fifth card (called the kicker) wins. One pair: Two cards of the same rank, with three unrelated cards. If two players have the same pair, the hand with the highest ranked outside card(s) wins. High card Five otherwise unrelated cards-no pairs, no flush, no nothing'. In this sad case, whoever has the highest ranked card or cards wins the hand. So Kh, 9s, Sd, 3d, 2c beats Ks, 9d, 6c, Sc, 4d.